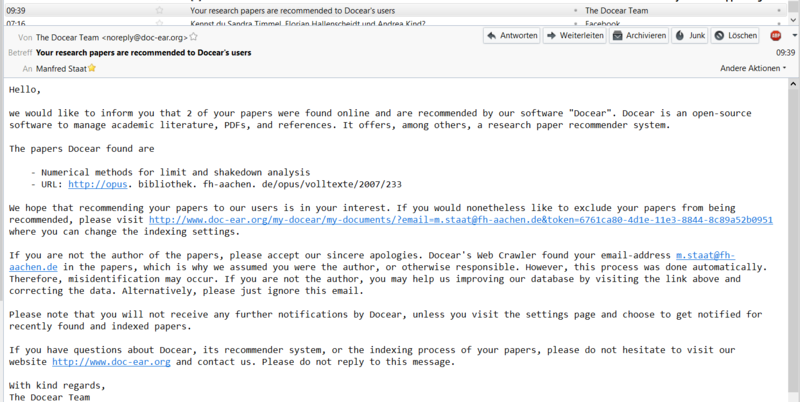 Forum » Docear Support Forums » General Feedback & Questions » How to correct "Recommended documents"
Topic: How to correct "Recommended documents"
How to correct "Recommended documents"
I have been asked by Docear if I was the author and would like to have my paper recommended by Docear. I would like to say yes. But the link to the correct title has changed. I can only say correct or incorrect to the title. But how could I tell you the correct link? I have not fund any editing modus. Re: How to correct "Recommended documents"
currently, we cannot change any links etc. because they would automatically be replaced by our crawler. however, we know, this is not ideal and hopefully will be able to change this soon. Version: 1.0.33.2 ; Page loaded in: 0.096 seconds.